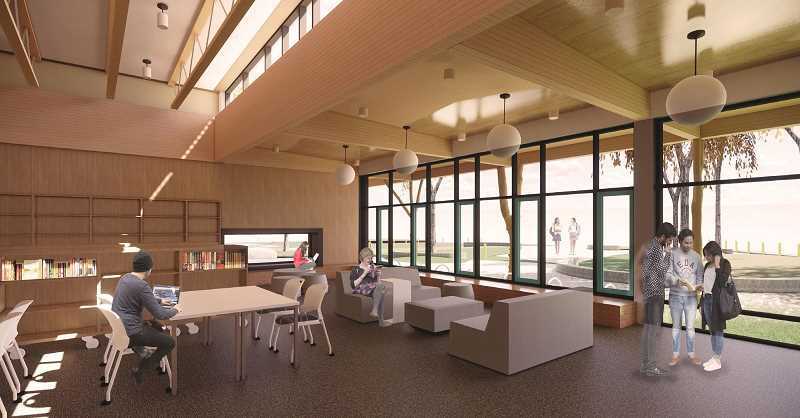 Reclaimed wood, cafe-like dining areas, flexible furniture, a large courtyard and a sleek and modern design — those are just some of the features included in the latest plans for the new Lakeridge Junior High. 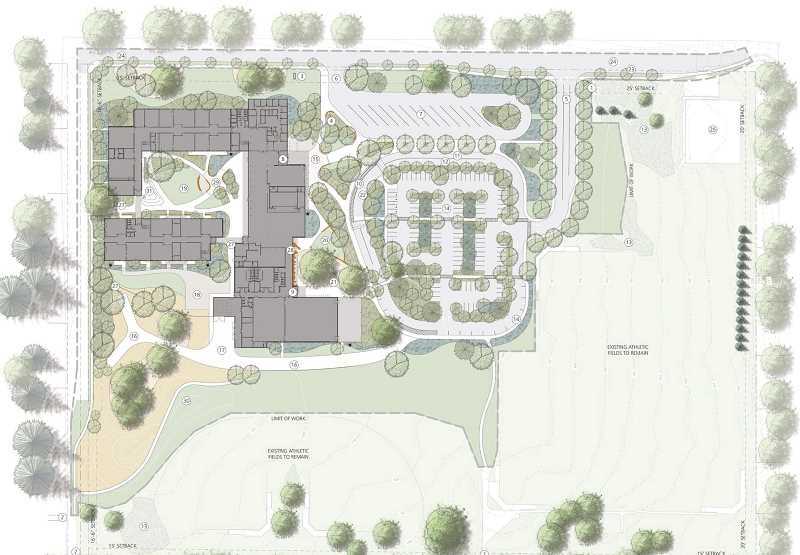 Mahlum Architects presented its concepts for the replacement building to the Lake Oswego School Board last week. With the design development phase at 100 percent, officials will now start preparing construction documents and begin the process of applying for demolition and building permits. Demolition of the former Bryant Elementary School is scheduled to begin in January, with construction of the new school to follow in May 2019. If all goes according to plan, students and staff should be able to move in during late summer 2020 and start the fall term in their new school. The new school will be built where Bryant now stands, at the corner of Jean Road and Central Avenue. Parking will then replace the current junior high. Existing athletic fields will remain where they are, with completion of the entire process planned for December 2020. Funding for the new LJH was included in a $187 million bond measure approved by voters in May 2017. Estimated cost of the new 141,000-square-foot junior high, according to Randy Miller, the LOSD's executive director of project management: $68.2 million. "This is an opportunity for us to design a school to meet your objectives," Mahlum associate Abby Dacey told the School Board. 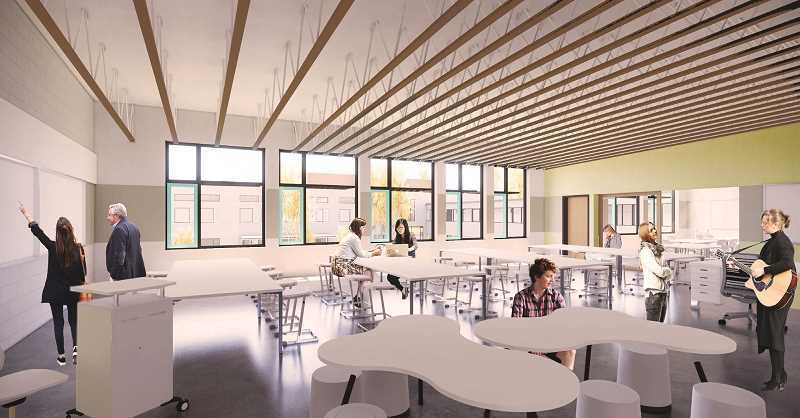 Through a series of meetings and design workshops with LOSD staff, students and community members, Dacey said, architects identified the top three goals for the new junior high as creating a learner-centric environment, promoting equity and creating a highly sustainable building. In response, Mahlum focused on providing interactive technology in "gathering spaces" that support multiple learning styles — from a whole-school meeting area to flexible "learning studios" and more intimate spaces for smaller groups. Gender-inclusive restrooms will help foster a greater sense of inclusion. The building, which is being built to hold 1,100 students, will feature reused materials from the old building and a hybrid passive cooling system that allows students and staff to "tune" the school for heating and cooling needs. 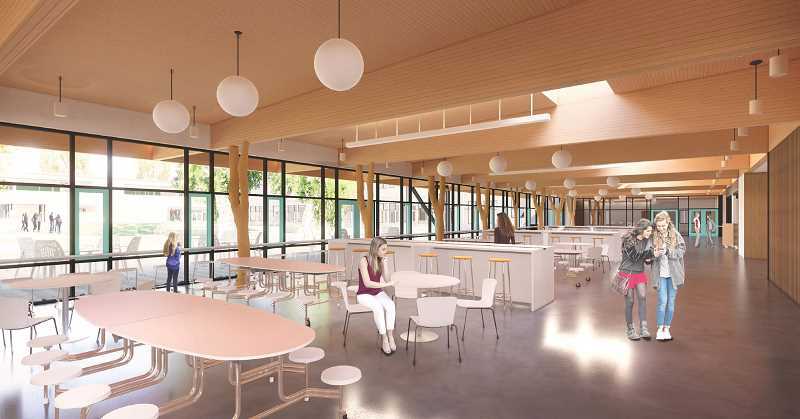 The entire school will be built to seismic standards that create a "very low risk" of earthquake-induced collapse, and the gyms, commons area, kitchen and locker rooms are designed to serve as a community resource in the event of a natural disaster. The new LJH is also designed with everyday safety as a priority. Staff will have eyes on all arrivals, and security vestibules will ensure that visitors have to check in at the office before gaining access to the rest of the building. "It's fundamental to control access to the new school," Mahlum associate Rene Berndt told the board. The courtyard will be entirely surrounded by the school, creating a secure outdoor space for students that can be accessed through all of the adjacent classrooms. The courtyard will also serve as a shortcut for students and allow for some fresh air between classes, according to Berndt. The school will be two stories tall. The first level will include science labs, the library, a cafeteria and eating areas, two gyms, a multipurpose area and more. The second level will feature additional music spaces and large, flexible "learning studios." Another cool feature of the design is that natural elements already on the site will be incorporated. A few existing trees will have to be removed, but Berndt said they will be used as natural columns inside and outside the school. "A company surveyed all the branches and did a structural evaluation," Berndt said. "The ones we had to take down because of the location of the school, we are able to give them a second life." The design will also incorporate boulders on (and underneath) the site as natural outdoor seating. "We wanted to make the boulders a feature," Berndt said. Architects put a lot of emphasis on making sure every space in the school will be accessible to anyone, no matter their needs or abilities. The building will include two elevators and multiple single-stall restrooms with changing tables that are large enough to accommodate both students and adults. "We have made sure that we have single-occupant restrooms to make sure that we meet the needs of everyone who uses the building," said Dacey. Also considered were the needs of students who may not feel comfortable using the bathroom or changing in front of other students. "Within the locker rooms we have provided private changing areas as well as separate showers and restrooms," Dacey added. Common areas were also designed with flexibility in mind. At lunchtime, students can choose between different environments to fit their social preferences and encourage healthy socialization. In addition to the more traditional eating area with large tables and high-ceilings, there will be small-group eating options in a low-ceilinged, cafe-like environment, which can also be used by students throughout the day. Students will also have the option to eat at tables outside in the enclosed courtyard. The library will look different as well. It will be equipped with flexible furniture, allowing the space to be used for after-hours events. The location of the library will allow staff to see students in the library as well as in common areas inside and in the courtyard. One of the most unique features of the school will be the "learning studios" on the first and second levels, which were inspired by the district's goal of making every classroom a STEAM (Science, Technology, Engineering, Art and Math) and/or Maker space. The studios will be larger than traditional classrooms, according to Dacey, to provide more room for students to explore. The rooms will be equipped with sinks, white boards, extra power, movable furniture and a flexible central space, all connected by sliding glass doors to create a visual and physical connection. "There will be more space for storing projects, making things and learning things in really innovative ways," said Dacey. School Board members were impressed. "I'm really excited to see this," said board member John Wallin, singling out the ability of the new school to provide students not only with physical safety, but social and mental safety as well. "I love seeing this unfold," said board member Sara Pocklington. "The greater level of detail we get each time is really exciting to see."